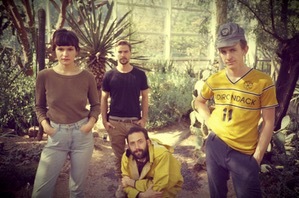 Big Thief performed to a sold-out concert at Baltimore’s Ottobar last Wednesday, just days ahead of the release of the group’s newest album, Capacity. With Adrianne Lenker on guitar and vocals, the group opened with Shark Smile, a song on Capacity that pays tribute to lost innocence and fatalism on the streets. With the backbeat supplied by James Krivchenia on drums, the song dwells on pain and loss, but importantly, the sense of pain and loss isn’t fresh. A kind of stale sadness is the core of the new album, but it’s not all about blues. There are upbeat notes in the new lyrics, too, and one of the opening songs, Mythological Beauty, is a paean to picking oneself up again after trauma. The album is an evolution from Big Thief’s other album, Masterpiece had 12 less-unified songs that also touched on trauma and loss. But it also featured light-hearted and even simplistic themes, like affinities for trucks. It’s like the transition from Revolver to Sgt. Pepper’s but in reverse, steering the band in a edgier, less literal style. The group’s four members, from Lenker and Krivchenia to Max Olearchik on bass and Buck Meek on guitar, have just released their latest album to thousands of fans as they prepare for a burst of activity that will take them to New York City after Baltimore, followed by Massachusetts and Canada, before swinging to the American Midwest. The band then heads to Europe, where its summer tour will wrap up with an appearance in London.